NASHVILLE, TN — Northgate Shopping Center in Bordeaux is an eyesore Councilmen Scott Davis and DeCosta Hastings want to see gone. 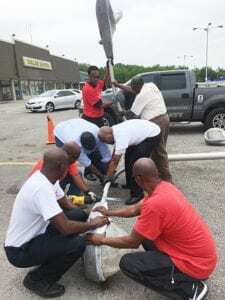 They held a press conference in the drab parking lot of Northgate Center last week and they used a reciprocating saw to cut up a fallen streetlamp that had been lying on the ground for months. 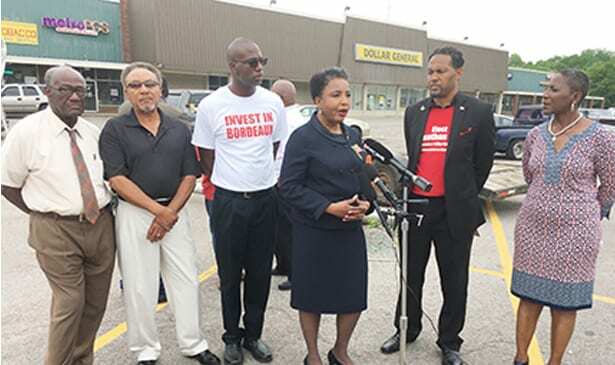 Mayoral Candidate Carol Swain and three candidates running to replace Nick Leonardo in District 1 joined the two city councilmen. The election is Thursday, May 24. “Right here you see a cooperative effort. People have put their differences aside. Candidates running for the same office are working together to fix our city’s problems,” said District 5 Councilman Scott Davis, who is running for House District 54. Rev. Dr. Judy Cummings, Sylvester Armor, and Jonathan Hall spoke about the need for investment in a community that has been ignored for decades. “We want those businesses that are here to invest more in the community and we want more businesses to come,” said Cummings. She said Bordeaux wants sit- down restaurants, and “something other” than a Family Dollar store for retail stores. 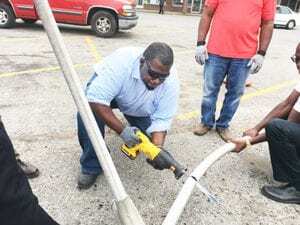 District 5 Councilman Scott Davis saws through a fallen light post last Thursday. The Northgate Center is anchored by a Dollar General store where the conveyer belt at the checkout stand hasn’t worked for more than a year, according to Armor. There is a liquor store, a tobacco outlet, a Pizza Hut, a men’s generic suit store, PCS cell phone outlet, and two short-term loan companies. Green HiIls it is not. Dan Lane is a realtor who has lived in Bordeaux for 30 years. “Southern banks and financial institutions have been very very reluctant to invest in minority communities,” he said. And it’s not just banks. The city’s investment in Bordeaux has been meager, too. “The city invested more than $100 million in Germantown, $80 million in the Gulch and the Bordeaux Redevelopment district has gotten less than $5 million. 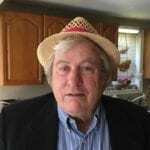 That is not parity and we will not stand for that anymore,” said Taurus McCain, a developer. McCain noted that right behind Northgate is a wealthy neighborhood of black professionals that moved to Bordeaux soon after I-40 cut North Nashville in half. The Invest in Bordeaux group dismantling a fallen parking lot lamp at Northgate Shopping Center in Bordeaux. Scott Davis, who heads the city council’s Black Caucus, is pushing a piece of legislation crafted by the NAACP’s Economic Development Committee. It has passed its first reading and Davis predicted there will be a big fight in the council on the second reading June 5. The smart growth development petition will be presented to the council at that meeting. We, the residents of District One, stakeholders and those elected as our representatives, stand united in support of this petition. Our purpose is to ensure that the same opportunities afforded the rest of the city are provided to District One. We want future developments that will house both new residents with higher incomes and existing residents who wish to remain in Bordeaux. We desire a safe place to live, nice sit down restaurants, shops, and improved schools and parks. No longer will we stand for our homes to be sold at a 40 percent discount; under-performing schools that lead to destructive juvenile delinquents; and the city dumping on us what other districts will not accept. Our community is united in our position that we will not give our vote to any candidate who is not fully committed, as we are, to a prosperous and thriving Bordeaux. Previous articleWhat Does a Dead Tooth Really Mean?